We’re back with another fresh round up of coin collecting news and articles from around the internet! Mint News Blog covers the latest product releases from the United States Mint, the 2013 Proof Platinum Eagle and the 2013 Girl Scouts of the USA Young Collectors Set. The field of candidates for the Baseball Coin Design Competition has been narrowed to 16 finalist designs, following judging by five members of the National Baseball Hall of Fame. Jeff Garrett compares the impact of bullion prices on rare coins in the early 1980’s to today. Coverage of a 1793 Large Cent which sold at a Bonhams auction for $140,000, more than 30 times the estimate. Stack’s Bowers Galleries has announced that it is combining operations with Teletrade and Spectrum Numismatics. Here is some further color on the announcement from Dave Harper. A CoinWeek video shows some cool coins at the FUN Summer Convention in Orlando. The ANA has responded to the lawsuit filed by former executive director Larry Shepherd. The Bureau of Engraving and Printing has recently confirmed that the first Federal Reserve notes with a tactile feature to aid the blind and visually impaired won’t be released until the redesign of the $10 FRN in 2020. An ABC News video and article on treasure hunters’ discovery of 48 gold coins worth an estimated $250,000 off the coast of Florida. The Singapore Mint has issued a portion of the mintage of a new coin in its own special slab. The Royal British Mint answers a wide array of Facebook questions. Part three on an article series covering the California Gold Rush. And now for some notable auctions. First, the 2006-W Reverse Proof Gold Eagle graded PCGS PR70 with First Strike designation. 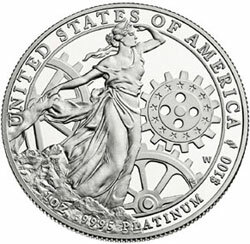 This represents the first reverse proof gold coin issued by the US Mint, which will be joined by a reverse proof Gold Buffalo later this year. Next, a visually impressive Double Struck Mint Error 1972-D Eisenhower Dollar authenticated by ANACS and graded MS63. The full date and mint mark on both strikes is visible.